A master’s degree is an academic degree awarded by a college or university upon completion of a specific course of study. Students obtain a Master's Degree to further their studies in a specialized field and to gain highly developed skills in analysis and critical thinking. 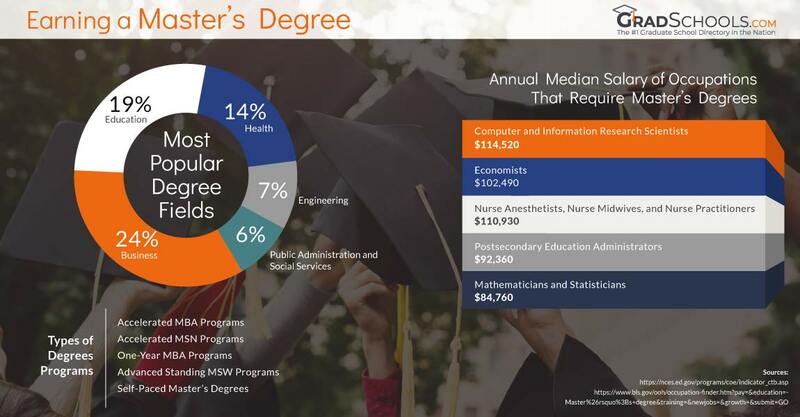 Also known as a second-cycle academic degree, a Master's Degree usually precedes a Doctorate or Ph.D.
On average, full-time workers with a Master's Degree can potentially earn $25,000 more per year compared to all workers, according to the Bureau of Labor Statistics. Professional development, cultivating more expertise in your field of study, and potentially earning a salary increase, are a among the reasons many students consider earning a masters degree. In some occupations you are likely to need a Master's Degree in your field to qualify for entry-level jobs. According to the Bureau of Labor Statistics, a master’s degree may not be required but having one might lead to advancement or higher pay. Another reason to earn a Master's degree is that it usually required for those continuing education at the Doctoral level. How Long Does It Take to Earn a Master's Degree? Most master degree programs require 1-2 years of study, depending on the program type and enrollment. This may entail completing around 36 to 54 semester credits or 60 to 90 quarter semester credits; equivalent to about 12 to 18 graduate-level courses. Of course, program lengths and course requirements vary by school and type of Master's Degree Program. A bachelor's degree is typically required to apply into a Master Degree program, although some programs offer a combined bachelor's to master’s program. According to Sallie Mae, the average cost of a master’s degree was $24,812 for 2016-2017 full-time students. However, earning a Master's degree can vary in cost based on several factors such as in state residency, out of state residency, online, blended or accelerated programs. Learn more about how much a Master's degree might cost here. Many graduate schools charge a cost per credit hour instead of charging a flat fee for tuition. This unit price reflects the number of classroom hours per week throughout a term. Usually it's 3 credits per course, and around 30 to 36 credits to earn a master's degree. Learn more about average cost per credit hour for a master's degree. What is the Best Master's Degree To Get? The best master's degree to get depends completely on your goals. For many it may be to increase your salary or to gain more skills in a specific area. Below are the most popular in terms of degrees awarded by subject. The Master of Science, or MS degree, is a type of masters degree that is typically awarded in the sciences, technology, engineering, medicine and mathematical subjects such as computer science and analytics. Generally, an M.S. degree takes 2 years of full time study and requires a thesis or research project. Admission to M.S. programs is usually contingent on the applicant having previously obtained their Bachelor’s degree which is often a Bachelor of Science. The Master of Arts, or MA degree, is a type of graduate degree which includes all arts and humanities disciplines as well as some social sciences. The M.A. degree is typically awarded in English, history, communication studies, international relations, international business administration, humanities, philosophy, and social sciences. Generally, an MA degree takes 2 years of full-time study for a non-thesis program, and longer for a thesis option; the Master of Arts (M.A.) may either be entirely course-based, entirely research-based or a combination. Admission to M.A. programs is usually contingent on the applicant having previously obtained their Bachelor’s degree which is often a Bachelor of Arts. The Master of Fine Arts, or MFA degree, is a graduate degree that usually requires 2 to 3 years of postgraduate study after a Bachelor’s degree (Bachelor of Fine Arts). Unlike the Master of Arts, the M.F.A. centers around practice in a particular discipline and is recognized as a terminal degree in visual arts, design, dance, photography, theater, and creative writing. The Master of Business Administration, or MBA degree, is a master’s degree in business administration (management) that actually originated in the U.S. as a scientific approach to management; it is both a terminal degree and a professional degree. Core topics in MBA programs commonly cover accounting, finance, marketing, human resources, operations. The Professional Science Master, or PSM degree, is a graduate degree intended to allow students to pursue advance training in science or mathematics at the same time as developing workplace skills. PSM programs tend to be interdisciplinary, can take about 2 years of full time study, and usually involve an internship. Often, you can find the PSM degree in forensic science, computational chemistry, applied mathematics and bioinformatics programs (STEM fields). Some popular types of master degree programs are Master of Science (MS Degree), Master of Arts (MA Degree), Master of Fine Arts (MFA Degree), and Master of Business Administration (MBA Degree). The type of master degree awarded may depend on the school, program focus and area of study. “Earning my master’s degree has already opened new doors to career opportunities. I always wanted to return to the television industry after spending a majority of my career in a newsroom. Going to grad school helped me achieve that goal. I now manage an online graduate program in television management, teaching the industry’s future leaders.” Click To Tweet! What Master's Degree Degree Should You Get? The basic premise behind earning a Master’s degree is that the student has achieved a “high-order overview” of their academic discipline. This could involve the following. While Masters programs vary in scope, these capabilities might be achieved through rigorous coursework, a thesis paper or final project, an internship or supervised practicum, exams and case studies. If you are a professional and can’t take time off to earn a traditional master's degree, a MicroMasters program may be an accessible and affordable option. Consider that your Master’s degree should reflect your professional career needs as well as targeting your academic goals. Remember your M’s: MS, MA, MEd, MBA, MFA, PSM, and whether you are excited to study on campus or need the convenience of online. Read these helpful articles to help you navigate subjects like accreditation and applications. Finally, always reach out to the graduate school for full program details, especially because there are deadlines and you want to stay ahead of the class as you master your field of study! Can I Get My Master's Degree Online? Yes! There are many online master degree programs available! You can often choose between a campus and online masters program format as well as low residency formats which are mostly online but require some in-person attendance. In some cases, especially for human centered and medical fields, your options for online degrees may be limited, however a hybrid or low residency choice may be offered. Delivered as a part-time cohort program, the M.A. in Literacy Education program leads to certification as a Pre-K-12 reading specialist/consultant. Available on campus or online, the M.S. Criminal Justice program provides you with both theoretical and practical knowledge to succeed in the legal system. Cutting-edge program designed to prepare students to become Licensed Mental Health Counselors (LMHC) working with forensic populations. A two-year, full-time program, the M.A. in Forensic & Legal Psychology is designed to prepare students for applied, clinical, experimental, or related Ph.D. training focused on forensic or legal psychology. The mission of the Organizational Psychology program is to prepare students for professional excellence, ethical leadership, and service to people and society through enhancing life in the workplace. The Master of Science in Nursing is for Registered Nurses who are licensed to practice in the State of CA; who possess a bachelor’s degree; and who want to advance their careers by preparing themselves to be health educators, college faculty, or leaders. Prepare for both generalized and specialized practice in Sacred Heart's broad-based MSW program. Develop a strong foundation in generalist practice at the micro, mezzo and macro level, then pursue your interest in direct clinical or community practice. Sacred Heart offers an entry-level MS in Occupational Therapy designed for persons with a Bachelor's degree in any field. The M.S. in Human Resource Management is designed for human resource professionals seeking upward mobility in the HR field and those wishing to enter the HR field with an excellent preparation. The Master of Science in Industrial/Organizational (I/O) Psychology program at Sacred Heart University will prepare students to be ethical practitioners of Industrial/Organizational Psychology. The M.S. in Accounting program offers two concentrations: forensic accounting and international accounting. Students can start the MSA program in Fall (September) or Spring (January). Utica College's online MS in Nursing (MSN) offers a Nursing Leadership (NL) specialization. Our changing health care industry requires nurses with more skills and knowledge than ever before. The online Master of Science in Nursing (MSN) program prepares registered nurses to become effective and ethical leaders, professionals, and health educators in an evolving health care industry. Benedictine University’s online Master of Science in Nutrition and Wellness program focuses on the interrelationships among food, nutrition and health as well as the development of crucial research professional skills for this growing field. The online Master’s in Special Education from Saint Joseph’s University includes specializations and certifications that are designed to meet the most pressing demands in today’s schools. The online MBA from Widener University focuses on long-term career success in leadership roles with a balanced curriculum of theory, practice, and professional development courses. Define your legacy with an online MS in Criminal Justice. Gain the knowledge and skills needed to critically analyze and ethically address the complex issues in contemporary society. Winthrop University's M.Ed. in Special Education Intervention program prepares licensed teachers to build, lead and participate in intervention programs that build self-confidence in students through a near-seamless connection. The online MBA at Our Lady of the Lake University offers a rigorous curriculum that incorporates personal attention from our faculty, instruction in the practical applications of business theory and strategy, and a progressive approach. M.S. in Nursing (M.S.) - Family Nurse Practitioner SpecializationWith your online M.S. With Northern Illinois University's online M.S. Learn to use big data to form and implement effective strategies in a management role. Queens University of Charlotte's online MSN Clinical Nurse Leader (CNL) track transforms you into a healthcare leader so you can ensure both your patients and your team have optimal results.